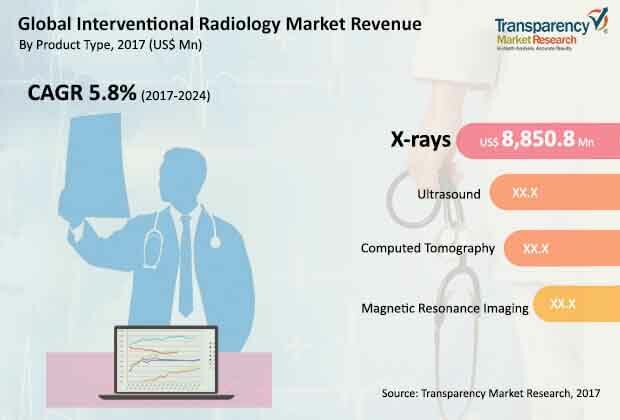 In a recent report by Transparency Market Research (TMR), the global interventional radiology market is composed to see modest growth in the years to come. The launch of new x-beam hardware products in the radiology market could consolidate the position of key players in the market. For instance, the launch of an array of x-beam hardware such as Allura 3D, FlexVision and EchoNavigator are further expected to strengthen the position of Phillips in the global interventional radiology market. As per TMR reports, the global interventional radiology market is estimated to expand into a revenue of US$ 22.9 bn with a CAGR expansion of 5.8% within the forecast period of 2017 to 2024. Asia Pacific is estimated to emerge as an attractive market for interventional radiology due to factors like image-guided therapeutic interventions and its rising acceptance. The market in interventional radiology for Asia Pacific is estimated to be valued at US$4.5 bn by 2024. Among the key product type segments, x-ray is foreseen to be most advantageous technology followed by ultrasound. Due to the increase in traumatic injury incidences, embolization is anticipated to hold an important share of 24.2 % by 2024 with regard to the application segment. Due to the fast pacing technological advancements in medical science, North America is holding prominence in the radiology market. Globally, chronic diseases like collateral cardiac problems and obesity are rising momentarily due to change in lifestyle and food habits. As a result of which new diseases are taking shape in the body which either has very expensive or no treatment. With the introduction of interventional radiology, a number of such fatal diseases are now diagnosed and treated. As compared to treatments and surgeries of old times, the interventional radiology method is less painful. As a result of faster recovery, shorter hospital stay and less post-surgery complications, the demand for minimally invasive procedures are rising worldwide. This procedure also involves image-guided treatment and diagnostics for curing cancer where interventional radiology is used to view inside the body and operate cancer, perform angioplasty and stent placement, balloon angioplasty, veterbroplasty-kyphoplasty and other such complex surgeries. This being a major success, the market for interventional radiology is likely to receive a boost in the coming years. Heavy excise duty is imposed on medical device manufacturers and medical device importers in the U.S. This is hampering the overall revenue of the interventional radiology market. Besides, the zero reimbursement for interventional radiology procedures in most countries worldwide is limiting its adoption hampering its growth in the market. Lastly, due to low adoption of digital-technology based systems the growth of the market is hindered. Low adoption of digital technology-based systems is bringing obstacles to the market growth. Expensive cost of digital radiology devices such as magnetic resonance imaging scanners or MRI scanners and computed tomography scanners or CT scanners have been giving way to alternative medical imaging such as ultrasounds. Although the cost of the radiology devices is more as compared to cheaper mode of treatment, the life-saving assurance rate that the implementation of these devices offer are much more worth of money. Other than that, interventional radiology is used to examine diseases such as mammography or breast cancer where an early detection can save life through radiation therapy or radiation oncology.